“Art Visions: Dynamic and Fanciful” — a joint exhibition by new Portola Art Gallery members Terry McMahon and Inna Cherneykina — is featured the month of January. The exhibition of oil and acrylic paintings includes vibrant and colorful still life, landscape and city scenes from the artists’ collections. Terry McMahon, a retired art teacher from the Menlo Park school district, has traveled and lived around the world. Her art work is influenced by her collection and love of folk art from the places she has visited and lived. She combines a strong sense of design with a bold use of color, and she gravitates toward sculptural shapes and forms. She enjoys rearranging or redefining forms, whether in architecture, plants, animals, or people. Most of her work is imaginative, while some is decorative and even fanciful. Inna Cherneykina is a painter and 3D game artist. Art for her is an exploration of the intricate interplay between the world and human mind in its most beautiful form. 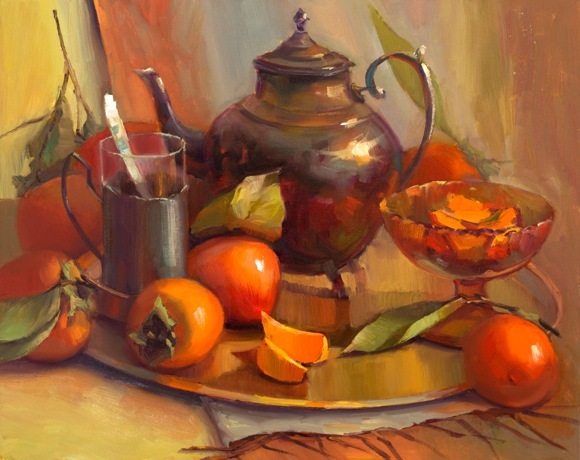 The still life compositions and landscapes she paints are reflections of this enigmatic entanglement of mind and reality. They fuse together the real world, her vision of the world, and her emotions brought to life by beautiful flowers or by gorgeous sunsets. A reception for the artists will be held on Saturday, January 23, from 1:00 to 4:00 pm. The Gallery is located at the Allied Arts Guild, 75 Arbor Rd., in Menlo Park.